After a quick search online the Salmons realised the solution they desired was our Outdoor Living Pod. Quickly booking a free survey and site consultation, our surveyor designed and recommended our Deluxe model Outdoor Living Pod with integrated screens, lighting and heating which would provide them with year round flexible protection and comfort from the elements whilst still giving them the true alfresco outdoor experience they loved with their awning. 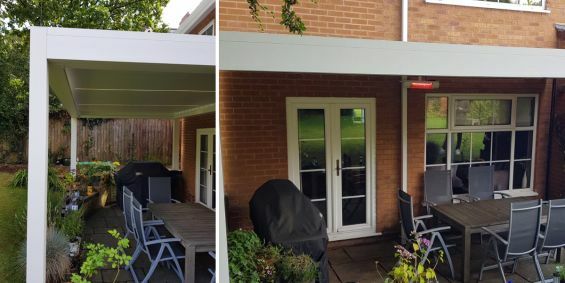 Following the installation, the client sent us the below email praising their whole customer journey and of course the Outdoor Living Pod itself. If you would like to find out more about the external shading experience with Caribbean Blinds why not watch our customer journey video above, or alternatively speak to one of our helpful team on 0344 800 1947.